We spent much of August getting my daughter ready for her first year of college in upstate New York, about as far away from Los Angeles as you can get and still be in the lower 48. Last-minute saves in the kitchen this time around included about a quarter of a small watermelon–5 or 6 inch-thick slices that I stuck in the freezer in a bag with the air squeezed out, hoping they wouldn’t be completely awful to use up somehow once we got home. I assumed it would be as hot when we came back as it was before we left, and that frozen watermelon in any form would be just about right. Of course, today Pasadena is in the 80s and Boston and points north are in the 90s for a massive heatwave. Everything seems a bit topsy-turvy in this country to tell the truth, and as I’ve remarked more pointedly before, has for some time. But at this moment, a world without Aretha Franklin in it– daring, flashy, cantankerous, exuberant, frank, funky, ambitious and endlessly talented–doesn’t seem right. I have a treasure of hers that I picked up from the local Goodwill’s vinyl bins a couple of years ago: a red-labeled 45 whose B side was in perfect, untouched, glossy condition–“Prove It,” a number I only realized later that I had heard before, because honestly it was unremarkable even with her singing it. The A side, on the other hand–scratched, worn down, dusty grooves, battle-hardened, loved to death and beyond, deservedly so. I quickly snatched it up for $1.99 and took it home, protected inside the cover of a hardback. Would it still play, was there any magic left? I stuck it on the turntable, nudged the needle arm over and lowered it as gently as possible. Even though our speakers are o-l-d and not that great to begin with, the music just leaped out at me. Hearing the classic twang of the guitar intro and Aretha’s intricate runs on Chain of Fools puts shivers up my spine anyway, but this was the real thing. Vinyl, even old scratched vinyl from the ’60s, when I was three or four years old, is so much more evocative than the sound you can get from an mp3 it’s a sin. Red is always how I’m going to think of Chain of Fools and Aretha Franklin, but looking back, she often chose a light pink for herself–one of her outfits on Soul Train for a live performance of Rock Steady, several of her later appearances too. I’ve never been a big fan of pale pink or Cadillacs, but I still love her exuberance and a song that full of juice and humor. And that brings me back to the frozen slices of watermelon and what I did with them yesterday. I knew that once it was frozen, the watermelon would probably have to stay frozen, because thawing it out would almost certainly cause it to collapse into limp mush, and what a shame (although I didn’t actually test that out, I would put good money on it). You can’t really buy watermelon ice cream or sorbet in this country, not at the supermarket anyhow, and I’ve never actually eaten any, not even as gelato in Italy, where (at least 25 years ago, when the artisanal gelaterie were still making it traditionally instead of from powdered mixes) they had just about everything you could put in gelato form and all the flavors came out really specific and vibrant and fresh. 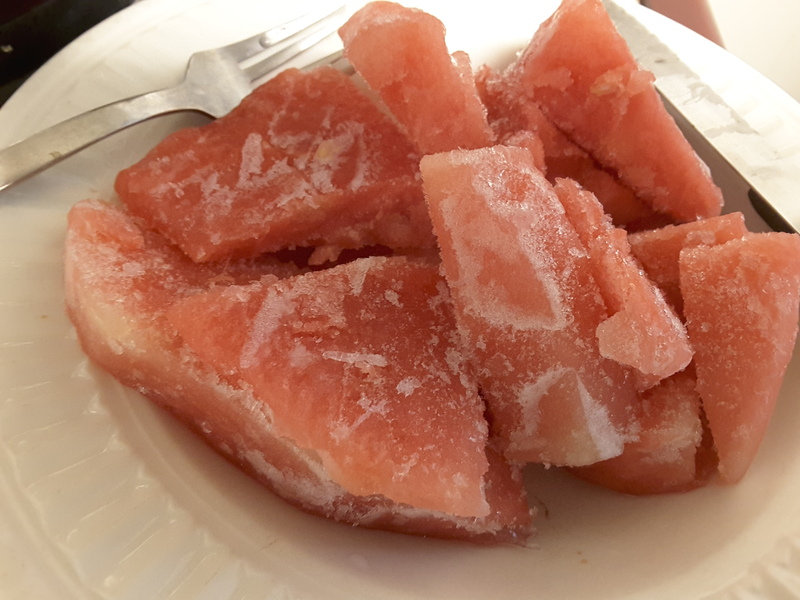 I wasn’t sure a watermelon ice I could make at home would actually taste good on its own, and I had something a little more offbeat in mind for the flavor since watermelon is kind of subtle. But it’s popular world-wide, from Africa to east Asia as well as throughout the western hemisphere, which gave me a few ideas. Well, it could either be good, inedible or just plain strange–and it turned out something between good and a little strange, so I’m counting it as a good rough draft, and we’ll call it unusual, exotic, still a bit subtle but flavorful, specifically watermelon with rose. And pink. I don’t know–maybe this would be better as popsicles or paletas, but I like the snowiness, and the watermelon flesh definitely contributes that delicacy even without an ice cream maker. And this one was pretty encouraging–cool, smooth, both down to earth and exotic, unexpected. Maybe a little like the Queen herself. 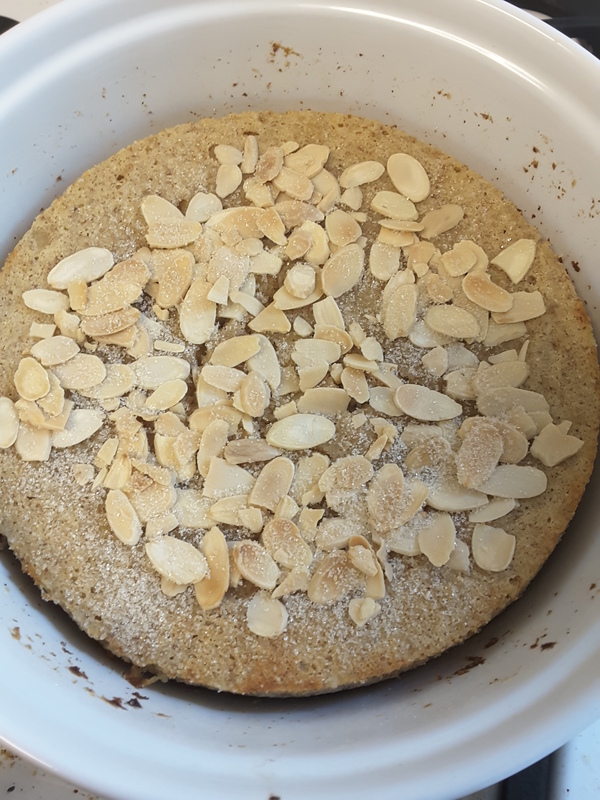 pinch of ground cloves, optional–this was the part I’m not sure I’d repeat; it wasn’t bad but it wasn’t quite ideal either in combination with the watermelon, the rosewater and the tartness. So probably leave it out. Microwave the frozen watermelon slices 30 seconds on an open plate, just enough to thaw a tiny bit so you can cut them into inch-or-so chunks for the blender or food processor and not break the blade. Add the lemon juice or citric acid, the sugar, the yogurt and rosewater (and pinch of clove? leave it out?) and a splash of milk, pulse to start it blending. Pour just enough extra milk through the processor spout to create a smooth thick icy milkshake-like blend, then pour the mixture into a 2.5 quart snaplock container with a lid and still-freeze, stirring briefly with a whisk after half an hour and returning it to the freezer. 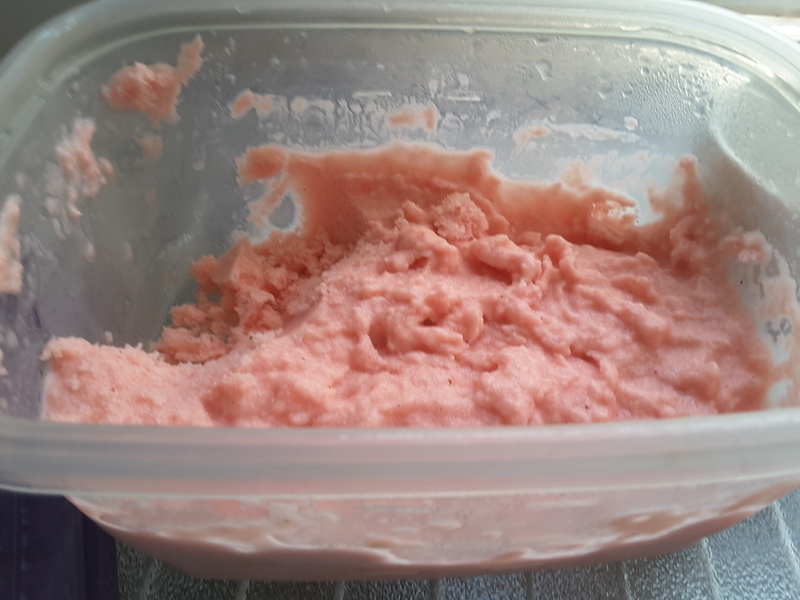 If you want an actual sorbet with no dairy, make a simple syrup by boiling equal amounts of water and sugar for a few minutes to dissolve and thicken slightly, cool it to room temperature and blend it with the frozen watermelon and flavorings, leaving out the yogurt and milk and regular sugar. The usual sorbet proportions are about 3/4 cup of sugar (so about 3/4 c sugar, 3/4 c water, boiled up to a syrup and cooled) for a quart of finished sorbet. 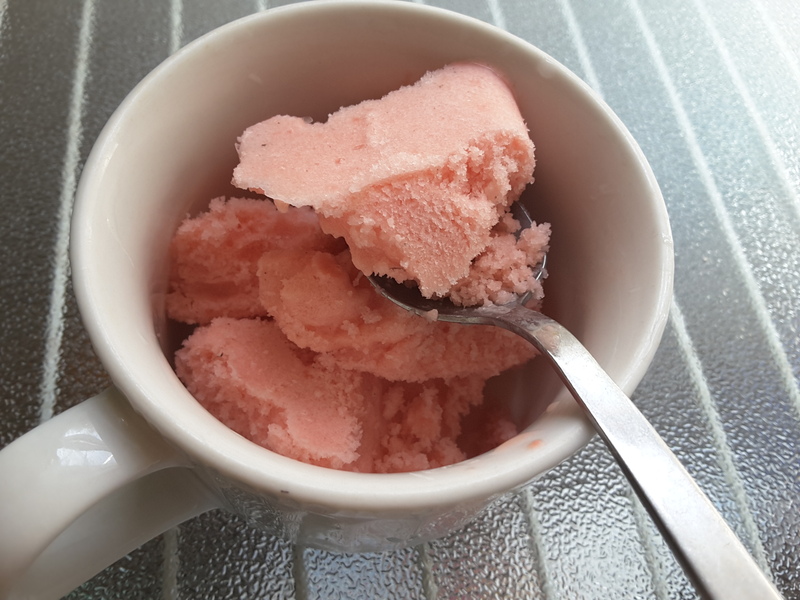 I find that a bit much sweet-wise and not as refreshing but it will deliver the kind of standard texture and cohesiveness you get in commercial sorbets. 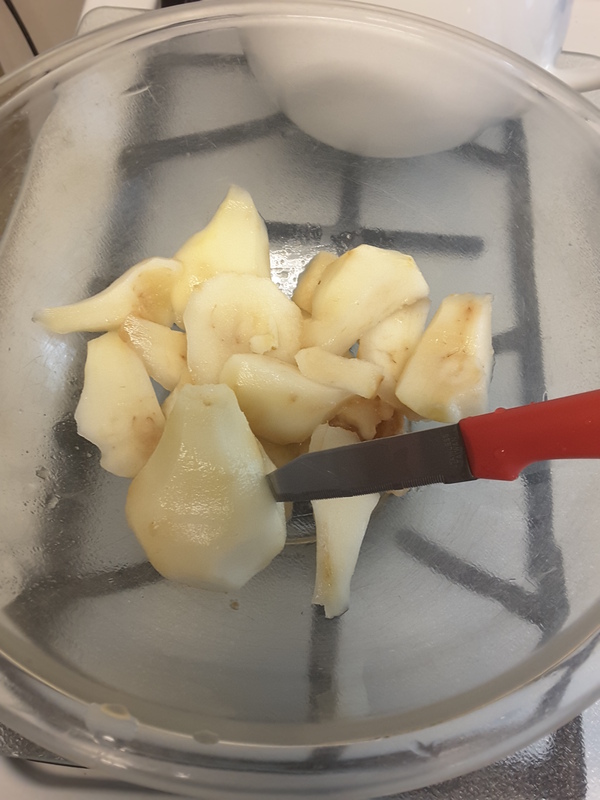 When pears are good, at the peak of ripeness and aromaticity, they’re very very good, and biting into one will see the juice roll down your chin. When they’re not at their peak, or even when they’re frankly over the hill, you can still use them to advantage. Slightly underripe pears slice thin and stay crisp in salads or on a cheese platter, something like jicama or underripe watermelon. They’re just barely sweet, not unctuous enough to upset the balance with a sharp vinaigrette or an aged cheese. Ripe pears can substitute well in a variety of desserts for either apples (when still firm) or bananas (when very ripe, or even overripe and getting mushy). So even if you’re not a big fan of raw pears, the occasional bargain bag may be worth considering for desserts. If you can get them organic at a decent price, do, because pears are on the “dirty dozen” list for absorbing pesticides. Trader Joe’s sells bags of 6-8 small to medium (3.5-4 oz.) organic pears for about $3 at this writing. But what if, as happens occasionally, the child who insisted she wanted them instead of apples yet again has eaten two, and the rest have sat neglected in the fridge for long enough to turn? Overripe pears don’t look very nice on the outside and may have gone bland and/or brown, but they’ve still got what it takes if you peel them and cut away actual bad spots. If they’re only a little overripe and still flavorful, use them for a sorbet or microwave them for a minute or so to turn them “micro-poached.” If they’re really soft and going brown, peel and core them, remove all the brown bits and then mash or blend them as you would ripe bananas to give body and moisture to a cake or torte. 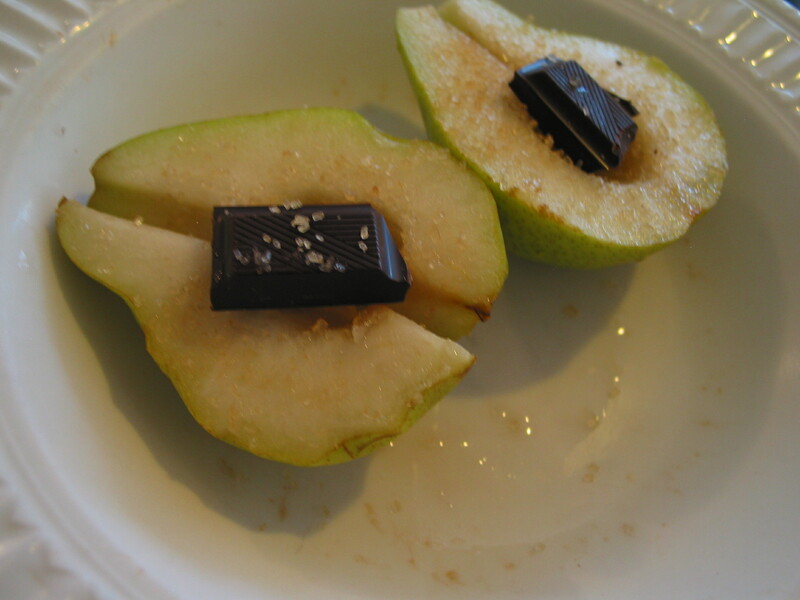 Here are two easy microwaveable desserts that use ripe to overripe pears and are Passover-worthy but can work anytime. This one’s very fast and impromptu–make just one pear or a few at a time and add a little time just as needed. It can be hard to find chocolate that’s labeled kosher for Passover. Depending on your level of observance, consult the Orthodox Union’s Passover Guide, which changes year to year but lists brands with kosher certification or acceptability even without a mark. If you eat kitniyot (beans, legumes, corn and peas, some spices, seeds and nuts) you can probably eat most chocolate that contains soy lecithin and vanilla. If not, look for the specially marked Elite chocolate bars that are kosher certified for Passover–for the Orthodox Union in the US, it’s the regular OU symbol (a capital U in a circle) but with a capital P superscript at the right. Other kosher certification at the Orthodox level is most likely to be the Hebrew letter kaf and/or a paragraph of Hebrew text naming the certifying rabbinical authority and location, sometimes with a circular seal containing the text (usually this is if it’s an Israeli product). There may be other certified or acceptable chocolates made with vanilla beans rather than extract (or without vanilla at all) and without lecithin–some of the high-end organic brands, for example. Dark chocolate, your preference for cocoa percentage, brand, etc. 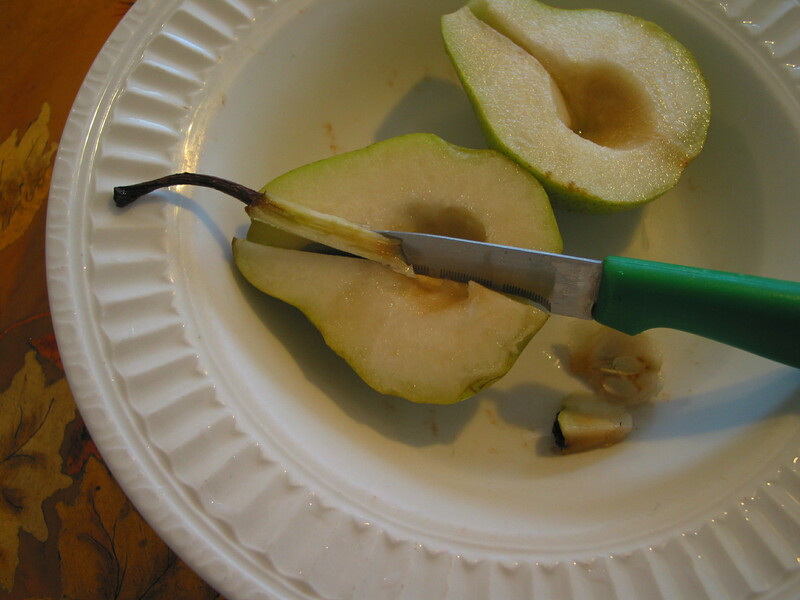 Wash the pears, split in half and trim out the seed core and stem threads. Lay the halves face up on a dish or plate that can go in the microwave. Place a square of chocolate on each half about where the core was. 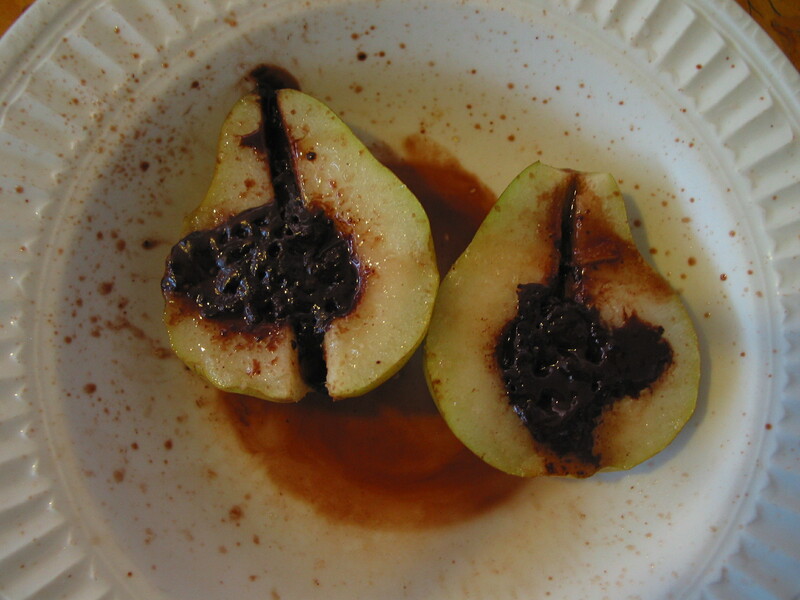 Microwave 1-2 minutes per pear, just until the chocolate starts to melt and bubble and the pears are tender. Sprinkle with turbinado or other sugar and spices as desired before or after microwaving. Eat with a knife and fork–add blackberries or a dollop of yogurt on the side if you want. Let it cool a little before digging in–I’m never that good and the roof of my mouth sometimes suffers for it. 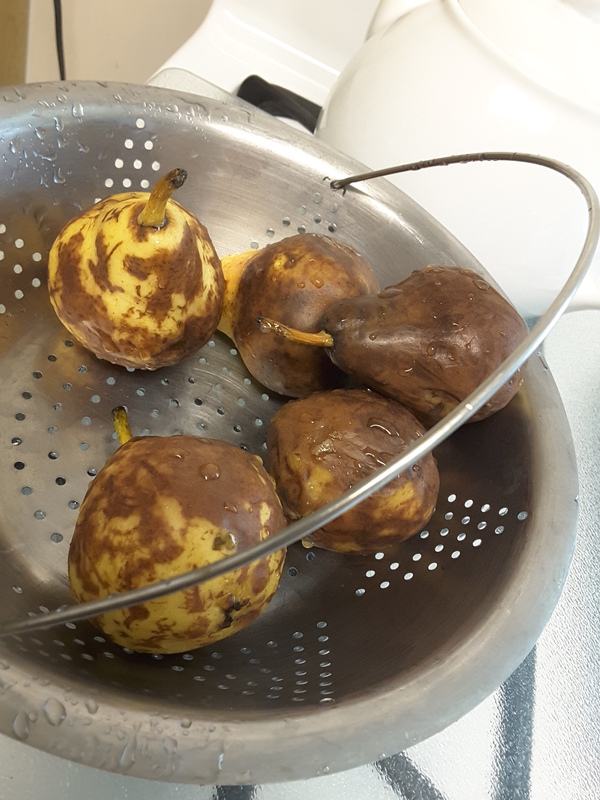 Only, obviously, I had 5 small way-overripe pears to deal with. Brownish to quite brown on the outsides. But good enough inside to yield about 1 to 1 1/2 cups of pear once they were trimmed. And the result was seriously delicious. It’s Valentine’s Day again–midweek, busy, too many items still on the list from last week to want a lot of fuss–or even be able to guarantee that my husband and I will both get home a reasonable time for dinner in a reasonable frame of mind to celebrate romance by cooking, or eating, something fancy. Last night I spied way too many people at the Trader Joe’s heaving large bars of chocolate and multiple bouquets of hothouse roses toward the cash registers. That’s okay–I’m not raining on anyone’s actual romance, but I have to admit I’m not feelin’ the official holiday symbols this week. Chocolate is good, don’t get me wrong. Flowers are pretty but require a vase and a pair of shears–usually right when I’m trying to cook dinner. Last year we actually managed éclairs, and it was fun if a bit much–even though I managed to strip it down considerably with the microwave. Microwaveable ganache truffles are also easy, quick and fun if you’ve got the time to feed them to someone you love. But with a kid who’s now waiting for college acceptances (and us parents anxiously figuring out both taxes and how to get around the outrageous Estimated Family Contribution)–well, we could all use a smallish midweek-style treat that doesn’t involve even that much effort to make–or work off afterward. Lately I’ve been digging around in my cooking “blank books” from the last couple of decades. Part diary, part notes to self with or without illustrations in scratchy pen and occasional bragging, political satire, or outright swearing as the situation demands–when you’re writing cooking instructions for yourself, why not? I started these books long before the era of the blog, and hunting through them takes me back to what I was doing at the time. It’s small, and there are no leftovers. Sometimes that’s a plus. This would probably be a decent rescue option if you had to make dessert with whatever’s in the cupboard and the fridge, and you’d left things till the last minute…or even a little later than that. As slapdash as this quickie is, it’s got big, big advantages over anything storebought–time, taste AND chocolate. Also, modest calorie and carb counts. Not everyone has a grocery that carries labaneh, which is kind of a Middle Eastern cross between sour cream and yogurt cheese. Nowadays, though, a lot of mainstream supermarkets are carrying plain Greek yogurt, which also works pretty well, even nonfat. And not every doctor approves of cheesecake in any quantity, much less huge. Damn, as I’ve said before, my cholesterol-packin’ genes (also jeans, but that’s another matter). 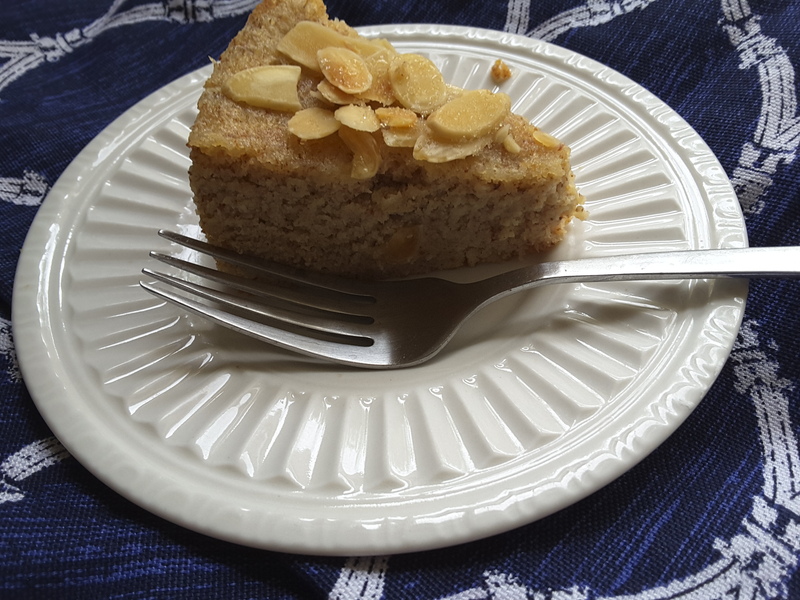 The completely nonfat version of this dessert works fine and tastes good too, now that I’ve retried it, and all the ingredients are real. 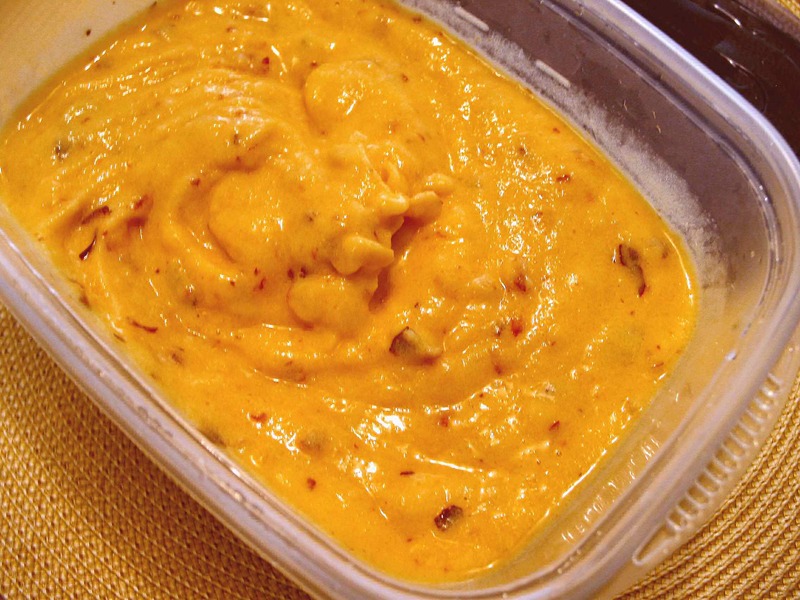 So–whomp the ingredients together in a bowl, nuke it about 3 minutes, cool it, stick it in the fridge. Serve it with raspberries, peaches, cherries, whatever goes with chocolate in your book. Or jam (raspberry, apricot or sour cherry would be great on this, and so would marmalade…). Serves 3-4 in smallish wedges if you don’t care how it looks–otherwise (probably smarter) pour it into small single-serving ceramic cups before microwaving. If you double the ingredients, it’ll need another minute or so in the microwave. Definitely serve with fruit. Whisk everything together until smooth in a microwaveable ceramic dish (big soupbowl is fine), or else mix and then pour into small microwaveable coffee or flan cups for individual servings (more attractive and probably less prone to serving mishaps where it falls apart when you cut it and lift it out). Microwave uncovered on HIGH 3 minutes for the big bowl, maybe 2 minutes for the individual cups, checking progress and adding extra time in 20-second increments just as needed so you don’t overdo it. When it’s done it’ll be a little dry around the edges and just pulling away from the bowl or edges of the cups. Cool to room temperature, cover and chill until it’s time to serve. Cut in wedges with a sharp knife if you went with the single bowl version. A pie server would probably help it keep its shape long enough to dish up. Variations–add some grated orange peel or marmalade to the mixture; add a spoonful of almond extract, vanilla, amaretto, or hazelnut liqueur; add espresso instead of water…? Carb counts: about 17 g apiece for 4 servings, 23 g each for 3 servings, all of it in the form of sugars. A quick last-minute wish for peace and a sweet and prosperous New Year to everyone. I know it doesn’t look that likely, between the physical and political versions of “weather” in the news, but I try to remember that it begins with us in our own neighborhoods and that we can make a difference by our own actions. If you haven’t yet, please make an effort to donate aid–even a couple of bucks–to the victims of Hurricanes Harvey, Irma and Maria and to the victims of the earthquakes in Mexico. If you have neighbors and friends waiting to hear from loved ones caught in these disasters, do what you can to support them. In the meantime, if you’re stuck for a last-minute dessert that works along the theme of “honey”–try baklava. I’m not actually kidding–if you have a toaster oven (for smaller amounts, 7-10 portions) and a microwave, and you have the makings of baklava (a roll of fillo, a bag of walnuts, some sugar and sweet spices and some butter or light-flavored vegetable oil), plus a bottle of honey, you’re in business. Of course, you could do apples instead of walnuts and make a strudel instead–also good and pretty easy. Peel and slice up or chop the apple (s), stick the pieces on a plate and microwave a minute or so to cook through and drain the juices before sprinkling on sugar, spices, and crushed nuts or breadcrumbs and/or raisins, and rolling up in fillo. These are kind of like “ladies’ fingers” Moroccan fillo pastries, only with walnut filling rather than almond paste. Rolling individual fillo sheets is easy and a lot quicker (and more fun, frankly) than layering several sheets flat and neat and then cutting pieces and baking and pouring a big jar of cold syrup over the hot pan. Plus the traditional syrup soak is a huge overload of sweet that’s admirable in its own odd way but very rich and hard to deal with–very sticky–right before you have to head off to synagogue. This is kind of a modular recipe–make just a few rolls if you feel like it, drizzle a bit of honey over the rolls at will. Slice the butter thin and melt in a ceramic or other microwaveable bowl, about 2 minutes. Put the walnuts in a plastic bag with some room and roll over them with a rolling pin or wine bottle to break them up fairly fine with a few 1/8th-1/4 inch bits, or if you feel like it, chop them in a food processor, not too fine. Add the sugar, spices and orange blossom water or juice to the bag and mix them into the nut meal. Unroll the fillo carefully onto a clean flat surface (lay down plastic wrap first as needed). Put a plastic sandwich baggie over your hand and dip it lightly into the melted butter. Dab on the top sheet of fillo. Fold the fillo sheet in thirds lengthwise. Grab a small handful of the nut mixture (2 T-ish), squeeze, and place at one end of the fillo strip. 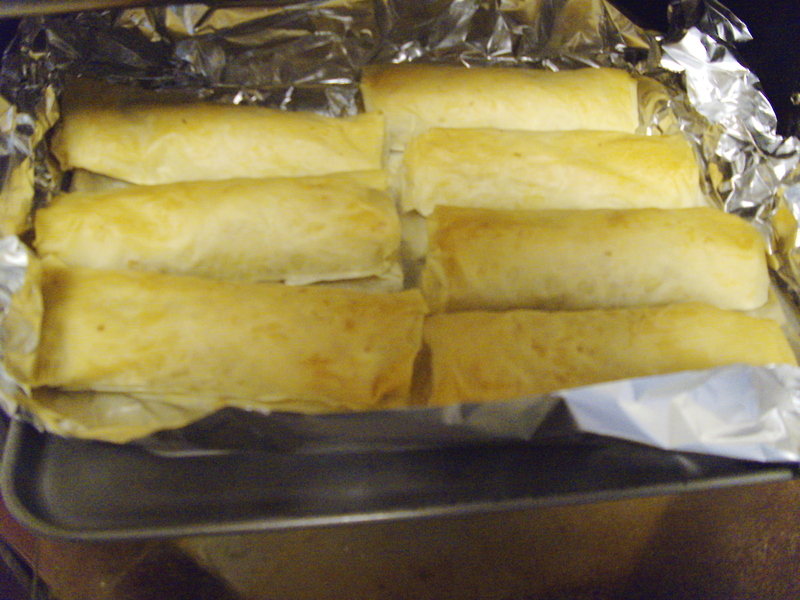 Tuck the side edges over it by 1/4-1/2 inch, then roll the end over and around the nut filling to enclose it. Dab a bit more butter on the rest of the strip and roll it up. Place on tin foil. Repeat with the rest of the fillo sheets until you run out of nut filling. If you run out of butter or oil, you can slice a bit more to melt quickly. You don’t need much per roll and the sandwich baggie should help spread it without absorbing any. 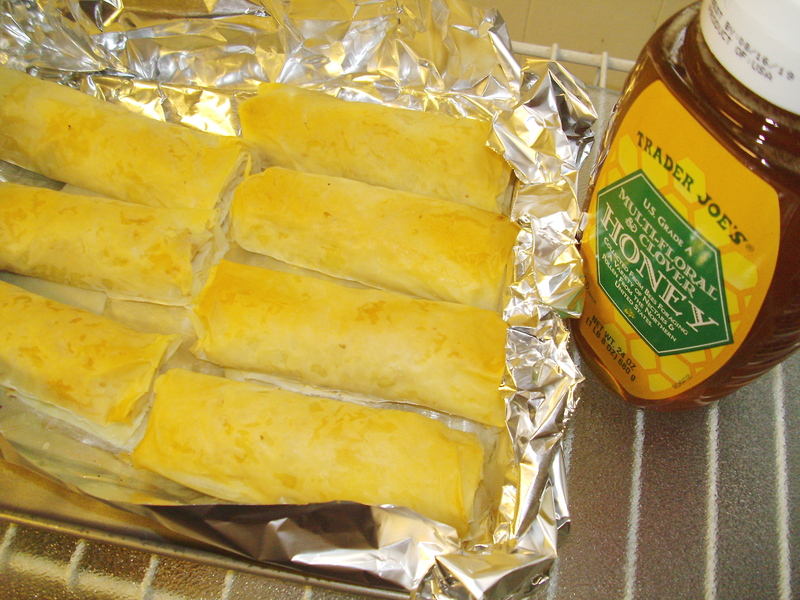 When all the rolls are made, dab the last of the butter or oil on the tops, wait a minute to let it sink in a bit, and place the sheet in a toaster oven (or your regular oven preheated to 350F). For the toaster oven, set to bake on 350-400F, not “toast”, for about 8-10 minutes and keep an eye on it so nothing burns. Bake until the rolls are a deep golden brown and smelling baked. Remove from the oven, cool and squeeze on a drizzle of honey to taste–about half to one teaspoon per roll is enough for flavor without submerging it in syrup. Last summer when I had too many nectarines all at once, and they were starting to go soft in the fridge, I sliced them up and froze them as-is to dig out and gnaw on whenever the temperature got over 100 or so–which it did, often. I did admit it wasn’t a recipe, as such, and that if you really wanted, it might be worth blending them up for a granita or sorbet. But it was too hot to bother, and I didn’t care how silly it looked to stand around with the freezer door open just to grab a wedge and chill myself a bit. This summer, luckily, I have the same problem–not the nectarines from the big Ralph’s/Kroger supermarket, those are still hard as rocks and have almost no scent most of the time. But the Armenian greengrocers get all the overgrown, just-about-overripe, bee-bitten and split-pit nectarines and peaches, the ones that aren’t perfect, hard and shiny, and that have an insane-making aroma when you pass by. Well–I hid them from myself as well this time, buried them under a couple of bags of fresh herbs for a couple of days, and when I relocated them, about seven of them were getting just to the point where I had to do something or else. So I cut them in wedges and froze them, of course. It was a lot–about a quart of cut-up fruit. And after testing out a couple of wedges, I thought, well, what if I try the sorbet thing with the rest of them after all? The only problem with sorbet is that it usually contains a lot more sugar syrup than I think it needs if the fruit is properly ripe. Three-quarters of a cup of sugar (150 grams) for a quart–sometimes just a pint–of sorbet is like drinking whole cups of Concord grape juice. Very spiky for a diabetic kid–or prediabetic adult. With the carb content of whatever fruit you use, it can add up to 35-45 grams of carb per serving. 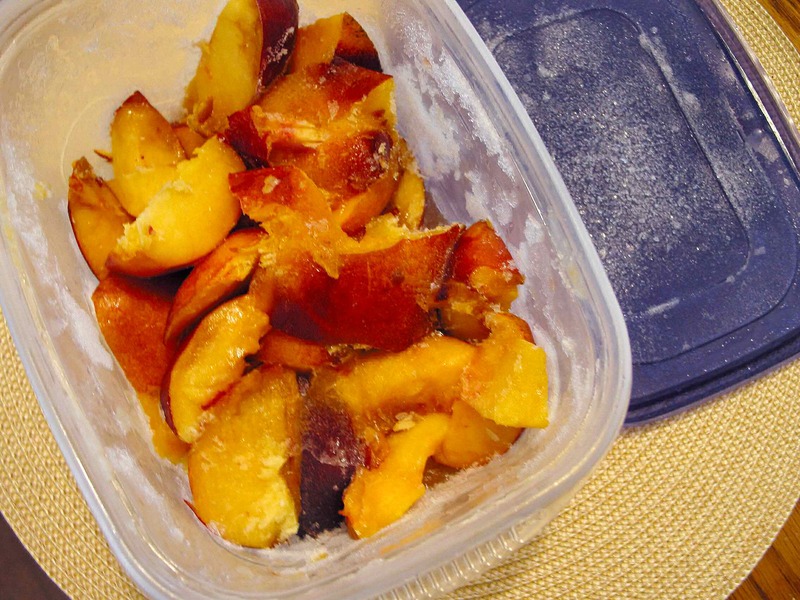 A whole large nectarine by itself has about 25 grams of carb, and at least it’s got fiber. And the toothaching standard of American commercial dessert sweetness blankets the taste of fresh fruit until it’s not really fresh anymore. It might as well be canned. This is acceptable–just–for blackberries and raspberries, which are pretty sour if you don’t add sugar, and which keep a lot of their flavor cooked, but absolutely horrible for nectarines and peaches. All the components of an éclair are at least partly microwaveable, flavorful and pretty forgiving. Even if you have to serve them upside down. Here we go again, because it’s been Valentine’s Day this past weekend and I have pretty loose time standards for such things…I did actually make these before dinner on the 14th, so it counts. Not that you really need VDay as an excuse. Éclairs are a lot simpler than they look in the pastry shops, and a lot cheaper than you’d think to make at home–in fact, cheaper than almost any American-style dessert in terms of calories, sugar, fat, salt… A surprisingly small amount of ordinary pantry staple ingredients goes a very long way and makes a bigger show than if you tried making brownies. 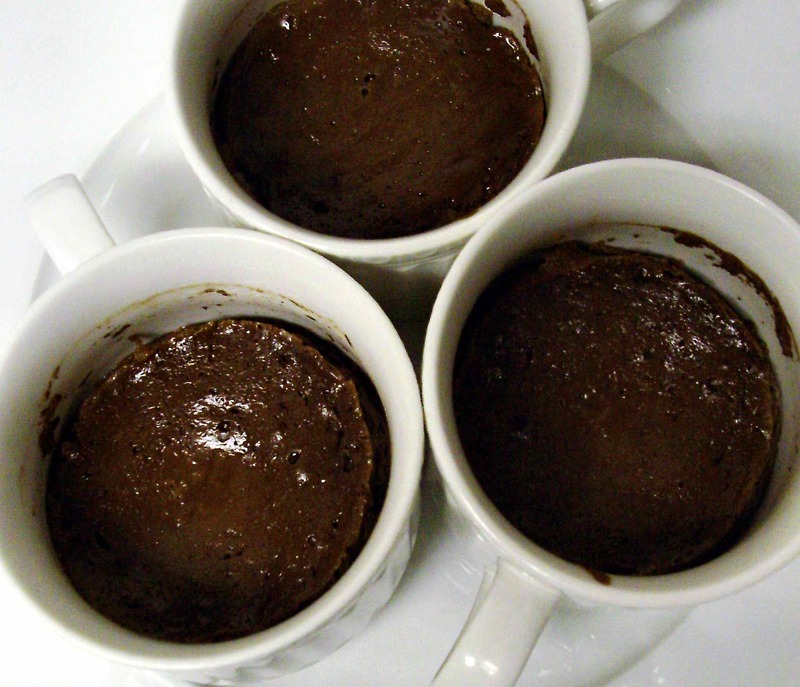 If you have a microwave, they can also be a lot quicker than most cookbook recipe specs, even though there are three separate parts to prepare and assemble–the filling, the shell, and the chocolate topping–rather than the usual American one-bowl dump-mix-and-bake scheme. Éclairs don’t hit you over the head with sweet–they rely on the contrast of textures and flavors between the mostly unsweet pastry shell, the delicately sweet pastry cream, and the deep chocolate (or other flavor, but it has to be an actual flavor to be good, not the typical flavorless, oversweetened canned cake frosting) topping. Éclairs have also become something of a canvas for artistic expression in Parisian bakeries; David Lebovitz has some great photos of ones with reproductions of paintings screened onto the tops, woodland scenes in colored icing and fondant and flavored marshmallows, fruit fantasias, and I don’t know what else, not to mention the fillings. They’re gorgeous to look at in the glass pastry cases but you couldn’t walk down the street, find a park bench, and just eat them with your fingers. You’d end up wearing them. So the classic chocolate-topped, pastry cream-filled éclairs are still my favorite, partly because you can’t find them in most of the bakeries here. Baking the dough is the one part you can’t really do in the microwave, more’s the pity (although you can do it in the toaster oven for a small batch). But otherwise, I can say it was worth it and–although I needed to step on a scale Monday morning to be certain–not that devastating dietwise…or even diabetes-wise. But, as with rugelach, you probably shouldn’t do this too often. Holidays and sharing are a pretty good idea. Leftovers are not. Limit the dietary badness. Unromantic morning-after nutrition stat check: At the medium-small size I made, they weigh in at about 22 grams of carbohydrate, 160 calories, 6 grams of fat (mostly saturated, from the butter and chocolate plus egg yolks) and maybe 40-50 mg max of sodium apiece. Verdict: Not too shabby for a French dessert. Could be worse and often is. Stick to one apiece, plus some fruit, and eat it with a light supper that includes a green salad and you should be reasonably fine. Also svelte, happy, and able to sing «Non…je ne régrette rien…» the next morning. But please don’t. Not before coffee. Even if you eat two at a time after supper because you’re not sure how long you can store the extras in the fridge so they don’t go all soggy the next day, it shouldn’t hit you like a ton of lead…well, not too much like a ton of lead. At least they weren’t full sized; they were pretty filling. Afterward, when we were lying in a daze on the couch recovering, my husband suggested just freezing any extras next time. He had a point. 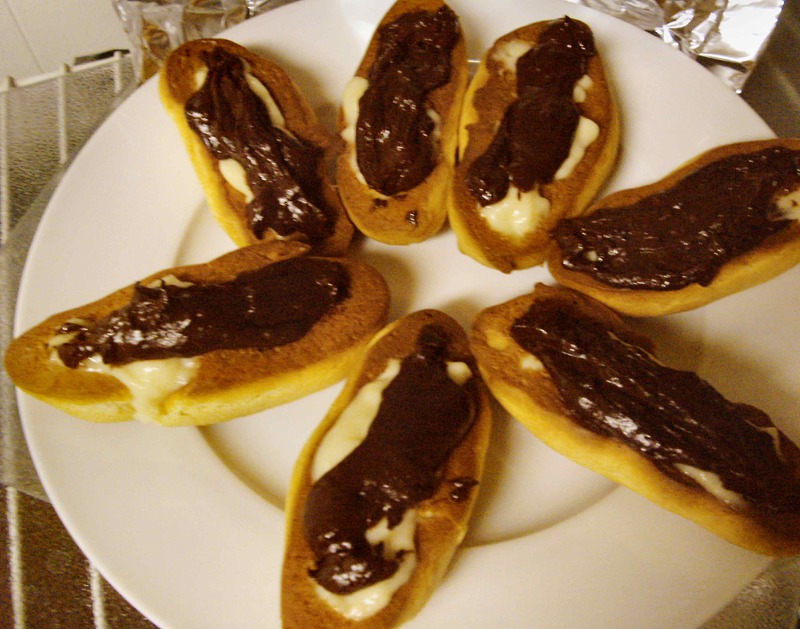 I was in a hurry and couldn’t find the lower-saturated-fat recipe I’d used successfully for “Emergency éclairs 1.0” so I went with the recipes for choux paste shells and pastry cream in the “basics” back section of the white Silver Palate Cookbook. The dough and pastry cream worked fine in the microwave, as I think almost any standard recipes would. The pastry cream was fine, but I hadn’t read all the instructions for the choux pastry, or I’d have known that the 3rd egg was for a completely unnecessary egg yolk glaze. When I halved the recipe I used an extra egg white as the “half egg,” and when the puffs puffed, they left nothing behind, no base, just a hollow, once I peeled them off the foil. The result was still fine for us but a little awkward for presentation–I had to sit them upside down like boats to fill them, and then cover the filling with the ganache. So definitely go back to the right proportions for the choux recipe (repeated below). The ganache…is always very chocolate, very microwaveable, very forgiving of awkwardness and therefore perfection itself. It covers a lot of sins and makes you feel much better about them. This is half-recipes all the way: it makes 6-7 half-size éclairs, 3″ rather than the standard 6″ monsters at the bakery. We each had two after supper and were completely stuffed.